Looking at my list of books read in 2016, I’m surprised to see that there are only 14 books on the list. I read every night, so why so few books? I think it’s because a lot of these are long books. Books that take me 1-2 months to read at my pace of 30-45 minutes per night. In fact, Harry Potter and the Methods of Rationality alone may have taken me 3 months to finish. It’s a behemoth. Here’s my list. I only included books I rated 4.5 stars or more (out of 5). 8. City of Mirrors by Justin Cronin: This is the first of several trilogies that concluded triumphantly this year. City of Mirrors is set in a world where vampire-like creatures have destroyed civilization, but some humans have managed to survive. Each book in the series is very different–it isn’t just telling the same story three different times. This final book shows how masterful of a plan the author had to bring everything together, despite the series spanning centuries. 7. Babylon’s Ashes by James A. Corey: There hasn’t been a bad book in this ongoing series about what happens in the solar system when mankind has branched well beyond Earth. Every character is compelling and unique, and the book avoids futuristic shortcuts. If you’re curious about this series, also check out the TV series based on it that started last year. 6. Bands of Mourning by Brandon Sanderson: This is the second-to-last (but not the second…it’s weird) book in the second Mistborn trilogy. Sanderson does magic really well. If you’re new to Mistborn, definitely start with the first Mistborn book and work from there (don’t start with the second trilogy). 5. The Last Mortal Bond by Brian Staveley: This is the third book in a fantasy trilogy, and it’s very solid conclusion to the story arc. It’s dark, but the darkness fits what the characters have gone through. Sometimes I’ve been let down by book 3s, but not this year. 4. Harry Potter and the Methods of Rationality by Eliezer Yudkowsky (review): I love Harry Potter, and JK Rowling has done amazing things with the character, but this is my favorite Harry Potter book. I never thought a work of fan fiction would end up on this list, but here it is! 3. Seveneves by Neal Stephenson (review): This is quite possibly the book that I’ve thought about the most since finishing it. There are so many interesting concepts and epic moments in this book, and it all feels so real. The basic concept (minor spoilers from the first 20 pages of the book) is that in the near future, Earth’s surface is going to be completely destroyed due to a natural event that will last 5000 years, and humanity takes to the heavens to survive. 2. The Girl with All the Gifts by M. R. Carey (review): This was the biggest surprise of the year for me. Unlike many of the others on this list, it’s not a long book, but it’s a really entertaining read with excellent character development. I’d recommend it without you knowing anything about it, but if you want a taste, check out the review. 1. 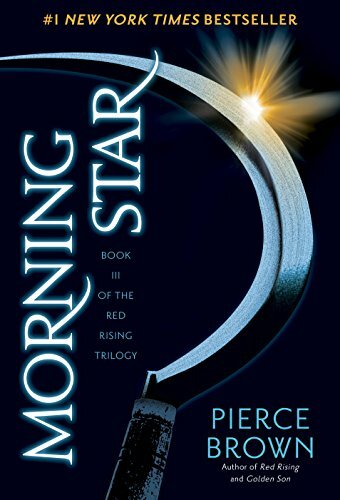 Morning Star by Pierce Brown: This is the third book of the Red Rising trilogy, and it stands as one of the best sci-fi trilogies in any medium. It’s a stunning conclusion, really–it answers every question in a satisfying way, it offers plenty of twists and epic moments, and the story moves forward by the strength of the characters. There is a moment in this book where something happens that actually made me gasp and put the book down. I simply do not have reactions like that, yet this book had that impact on me. Start with Red Rising and work up from there. You will not regret it. The book I’m most looking to in 2017 is the next book in Brandon Sanderson’s Stormlight Archives series. This entry was posted on Tuesday, December 27th, 2016 at 5:29 pm	and is filed under books, favorites and tagged with books, favorites. You can follow any responses to this entry through the RSS 2.0 feed. I commute about 1.5 to 2 hours a week and rotate between Audiobooks, rock music and a little sports radio depending on my mood and perhaps an upcoming concert. If it’s not in audio format AND available from my library, then I rarely get to it. Also, I have found some works (huge amounts of characters) or writing techniques (lots of subtle flashbacks) difficult to follow on audiobooks. My choices might be more vanilla than many as a result. In 2016 I finally read Ender’s Game and then Speaker for the Dead. Hearing the author’s comments on the 20th anniversary edition of the audiobook describe how EG was basically an introduction for SftD was really interesting and hooked me to listen to it back to back. Now I can watch the movie. A Man Called Ove by Fredrick Bachman was an interesting listen as we follow a man set in his ways and how he got the girl and the journey in his life. There are flashbacks, but easily discerned on the audiobook. The Unlikely Pilgrimage of Harold Fry by Rachel Joyce is probably my #1 book for the year. A moving story about a man and his walking journey across England to visit an old co-worker dying of cancer. There are numerous passages and quotes in the book that will stick with you when you set the book aside and really make you think. A story of hope, relationships, simplicity and so much more. If you want a book that will make you think and reflect on life, then this is a good one. Chris: Thank you so much for the recommendations! I’ve read Ender’s Game, but not the others. Not back to the height’s of Mirror Dance, sure, but not many books are as good as Mirror Dance overall, and while it’s a return to form for the series it’s more contemplative – read a couple of chapters, think about it for a bit, come back for a couple more, than the page turners that most books in the series have been for me. Stephen: Thanks for chiming in! I’ll have to check out Mirror’s Dance. Fortunately, they’re both available (or were while I was catching up with the series, at least) in the same omnibus, Miles Errant, along with The Borders of Infinity novella, which come to think of it is an excellent introduction to Miles as a character at the start of that omnibus, making it very easy to do so. Jamey, You are the reason I decided to read Seveneves, and I both curse you and thank you for this. That book is LONG!!!!! If I wasn’t listening to it as an audio book rather than reading it, I very much doubt I would have finished it. And because it took SO LONG to finish, I curse you. That being said, it was a great book. It was one of the most detailed and realistic sounding books I have ever read. Most importantly the characters kept me interested for the majority of the book, which is saying something because its A FREAKING TOME!!! But I did enjoy it, so thank you for that. *Review point (SPOILER) – I wan’t big on the return to Earth section of the book towards the end. I found it predictable and it felt forced and out of place. I can understand multiple reasons why the author did it, and that for many that might be the best part of the book, I just wasn’t a big fan. Zack: Ha ha…indeed, it is a very long book. I think it took me several months to read. That’s interesting to hear about the last 10% of the book. [Spoiler] I really liked reading about the other groups that survived, and I almost wish I could read books about each of them. Thank you Jamey for this post. It lead me to the discovering The Passage trilogy, and after last month’s binge listening to the trilogy, I’m down to the last chapters of City of Mirrors. What a breath of fresh air in my reading! Loved the evolution of the characters, the different feel in each book, the nostalgia induced feelings in the last book and the epicness of this century long story! Great find! Thanks Alex! It sounds like we have similar tastes in books. Is there a book you’d recommend? Replay, by Ken Grimwood, for a feeling of a long life. In a Sunburned Country, by Bill Bryson. For good laughter in a familiar and at the same time strange place, Australia. …but any Bryson book always manages to bring the mood up. The First Fifteen Lives of Harry August, by Claire North. Eternal life, world epic conspiracy. Touch by the same author is also good. Fire Season: Field Notes from a Wilderness Lookout, by Philip Connors. Memories in a wilderness solitude setting, without being boring. The Last Policeman trilogy, by Ben H. Winters. Looming end of the world setting and increasing chaos while a down to earth cop pays his dues. The Walking Dead comic books. Real people that evolve in a dystopian world. Lacks the epicness of The Passage trilogy, but the series is still going strong. It’s the only comic book I read. A volume per month. Almost all Stephen King’s books…. but my favorite is his non-fiction work, On Writing. As for the rest…. The Stand, Misery and 11/22/63 are excellent books to start down the King’s rabbit hole. Off to be the Wizard, by Scott Meyer is great. Why we Run, if you’re a runner. All You Need Is Kill is way better than Tom Cruise’s already excellent film adaptation and Eat, Pray, Love, for character evolution. P.S. – …oh! I forgot! Ready Player One is amazing! Awesome, thanks so much for these! Many of them are among my favorites (Replace, Harry August, On Writing, Ready Player One, and Eat, Pray, Love). I’ll check out the others!